Easy to use. Simply turn feet to adjust height -- place several units together for larger areas. 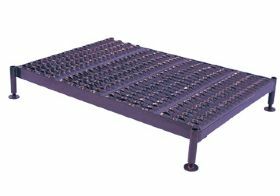 Heavy-duty serrated grating provides excellent slip resistance. Platforms 24" to 48" have 4 legs. Longer platforms have 6 legs. Powder coat finish. FOB Shipping Point. HEIGHTS FROM 5" to 8"
Product No. Size W x L Wt. (lbs.) Price Ea. HEIGHTS FROM 9" to 14"